Ehon with cover (chapter 12 of a picture book) 10 double page illustrations plus covers. 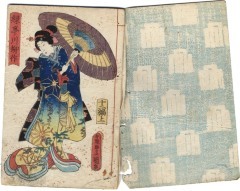 The publisher is Yamaguchiya Tobei (Kinkōdō). Ryokutei Senryu lived from 1787-1858. 'Harusame' in the title means spring rain.